A constellation is a group of stars that appears to form a pattern or picture like Orion the Great Hunter, Leo the Lion, or Taurus the Bull. Constellations are easily recognizable patterns that help people orient themselves using the night sky. There are 88 “official” constellations. Are the stars in a constellation near each other? Not necessarily. Each constellation is a collection of stars that are distributed in space in three dimensions – the stars are all different distances from Earth. The stars in a constellation appear to be in the same plane because we are viewing them from very, very, far away. Stars vary greatly in size, distance from Earth, and temperature. Dimmer stars may be smaller, farther away, or cooler than brighter stars. By the same token, the brightest stars are not necessarily the closest. Of the stars in Cygnus, the swan, the faintest star is the closest and the brightest star is the farthest! Most of the constellation names we know came from the ancient Middle Eastern, Greek, and Roman cultures. They identified clusters of stars as gods, goddesses, animals, and objects of their stories. It is important to understand that these were not the only cultures populating the night sky with characters important to their lives. Cultures all over the world and throughout time — Native American, Asian, and African — have made pictures with those same stars. In some cases the constellations may have had ceremonial or religious significance. In other cases, the star groupings helped to mark the passage of time between planting and harvesting. There are 48 “ancient” constellations and they are the brightest groupings of stars – those observed easily by the unaided eye. There actually are 50 “ancient” constellations; astronomers divided one of the constellations (Argo) into 3 parts. “Modern” constellations — like the Peacock, Telescope, and Giraffe — were identified by later astronomers of the 1500s, 1600s, and 1700s who used telescopes and who were able to observe the night sky in the southern hemisphere. These scientists “connected” the dimmer stars between the ancient constellations. There are 38 modern constellations. In 1930 the International Astronomical Union officially listed 88 modern and ancient constellations (one of the ancient constellations was divided into 3 parts) and drew a boundary around each. The boundary edges meet, dividing the imaginary sphere — the celestial sphere — surrounding Earth into 88 pieces. Astronomers consider any star within a constellation boundary to be part of that constellation, even if it is not part of the actual picture. Are all stars part of a constellation? No, there are billions of stars, and only a fraction of them make up the shapes of our constellations — these are the stars that are easily seen with the unaided eye. Ancient observers connected these stars into the star pictures. All stars, however, fall within the boundaries of one of the 88 constellation regions. As astronomers studied the night sky with modern telescopes, they were able to discern stars in the dark spaces around the constellations — stars that were not part of the original star pictures. You can see some of these stars by observing the sky on a dark night. If you look at the sky with binoculars, you will see even more stars. If you have a telescope, you will see even more! All the stars you see belong to one special group of stars — the stars in our own galaxy, the Milky Way. How are stars and other objects in the sky named and located? Hundreds of the brightest stars, those visible with the unaided eye, were given names in ancient times. These include Eltanin of Draco, the Dragon, and Vega in Lyra, the Lyre. Many of these stars have multiple names, having been observed by different cultures. Today stars are named by their coordinates on the celestial sphere. This is an imaginary sphere surrounding Earth. Earth’s north and south poles can be extended in space to this sphere, marking the north and south celestial poles, the poles around which the sphere spins. Polaris marks the intersection of the extended north pole and the sphere. Earth’s equator, extended into space, intersects the sphere at the celestial equator, dividing it into northern and southern hemispheres. All stars and objects in space, such as constellations, can be mapped relative to the poles and equator of the celestial sphere. Their position north or south of the celestial equator — essentially their latitude — is called “declination.” Their position east or west essentially is their longitude, or right ascension, measured in hours, minutes, and seconds. On Earth, we measure our longitude east or west from Greenwich, England; right ascension on the celestial sphere is measured from the intersection of the ecliptic (plane of Earth’s orbit) and the celestial equator. There are numerous catalogs of stars, each with a different scheme for annotating position; this means that each star has even more names! One of the most famous catalogs from the 1800s, the Bonn Survey, divides the sky into 1°-wide bands of declination and numbers the stars from west to east using right ascension. In the Bonn Survey ("Bonner Durchmusterung"), Vega is "BD+38° 3238” — the 3238th star in the band between 38° and 39° north. Another catalog, the Smithsonian Astrophysical Observatory (SAO) catalog, integrated 10 catalogs to include the positions of over 250,000 stars. Vega is SAO 067174 in this catalog. The Hubble Space Telescope has allowed astronomers to see even more stars! The Hubble Space Telescope Guide Star Catalogue currently lists the coordinates of over 19 million bright objects — 15 million of which are classified as stars! Illustration of the components of the celestial sphere. Why Do Most Stars and Constellations Move? The stars are distant objects. Their distances vary, but they are all very far away. Excluding our Sun, the nearest star, Proxima Centauri, is more than 4 light years away. As Earth spins on its axis, we, as Earth-bound observers, spin past this background of distant stars. As Earth spins, the stars appear to move across our night sky from east to west, for the same reason that our Sun appears to “rise” in the east and “set” in the west. Stars close to the celestial poles, the imaginary points where Earth’s north and south axes point in space, have a very small circle of spin. So if you find Polaris, Earth’s north “pole star,” you will observe it move very, very, very little in the night sky. The farther from Polaris, the wider the circle the stars trace. Stars that make a full circle around a celestial pole, like those in the Big and Little Dippers in the northern hemisphere, are called “circumpolar stars.” They stay in the night sky and do not set. At the equator, there are no circumpolar stars because the celestial poles are located at the horizon. All stars observed at the equator rise in the east and set in the west. Why Do We See Different Constellations During the Year? If observed through the year, the constellations shift gradually to the west. This is caused by Earth’s orbit around our Sun. In the summer, viewers are looking in a different direction in space at night than they are during the winter. Earth orbits our Sun once each year. Viewed from Earth, our Sun appears to trace a circular path. This path defines a plane called the plane of the ecliptic (or just the ecliptic). The zodiac is the group (or “belt”) of constellations that fall along the plane of the ecliptic. It is through these constellations that our Sun appears to “pass” during the year. While there are 12 astrological constellations of the zodiac, there are 13 astronomical zodiac constellations: Capricornus, Aquarius, Pisces, Aries, Taurus, Gemini, Cancer, Leo, Virgo, Libra, Scorpius, Sagittarius, and Ophiuchus. 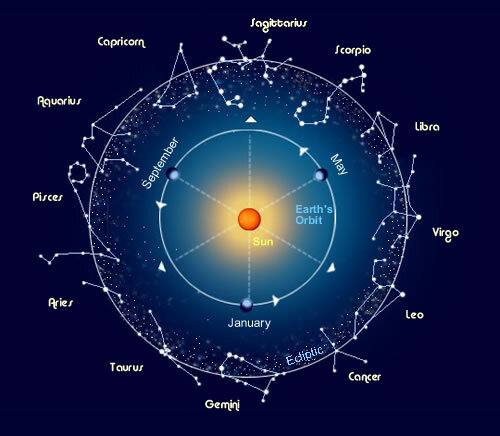 The annual cycle of the zodiac was used by ancient cultures to determine the time of year. Illustration of the “zodiac band” with a few of the constellations depicting the objects they represent. Most of the planets (except Pluto) also have orbits that are very close to the ecliptic plane defined by Earth’s motion (within about 8 degrees above or below). If you include all the constellations encompassed by this broadened definition of the ecliptic plane, you have 21 to 24 constellations of the zodiac! Why Don’t the Constellations Line Up with the Astrological Dates? The astrological signs were identified and connected to the calendar about 2500 years ago. However, since that time, the timing of Earth’s seasons has shifted. This is partly due to the fact that Earth wobbles a little like a top, making its axes point in different directions at different times. This is a predictable cycle of change over a period of about 23,000 years. Today the northern hemisphere winter solstice occurs during aphelion, when Earth is farthest from the Sun; about 6000 years ago, the spring equinox occurred during aphelion. Through time, then, the seasons have shifted with respect to the background of the zodiac constellations. Five thousand years ago, our Sun passed through Taurus during the spring equinox; today it is in Pisces at the start of spring. So if you ever wonder why your horoscope may be off a bit … perhaps by several thousand years … this shift may be the reason! The Big Dipper is not a constellation! It is part of Ursa Major, the Greater Bear. The Big Dipper is an asterism, a recognized, but not official, grouping of stars. Some asterisms fall within a single constellation, others cross constellations.